The studio behind Ratchet & Clank and Resistance will reveal their latest PlayStation 3 game before the next PAX. 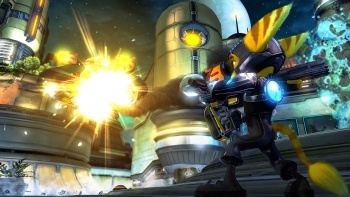 Insomniac Games' last release was Ratchet & Clank: A Crack in Time for the PlayStation 3 in October 2009, and the longtime Sony-focused but now future multiplatform developer has been silent about its current project. That silence will end sometime between now and September, as the studio announced in its recent newsletter that it'll reveal a new upcoming game before the upcoming Penny Arcade Expo. Yes, it's an announcement of an announcement, but by now I'm getting pretty comfortable with these. PAX 2010 runs from September 3-5, and Insomniac won't only be unveiling its latest title, but showing it off in a PAX panel on September 4 where it will be demoed and discussed with G4's Adam Sessler as moderator. We might get to see some actual gameplay when Insomniac announces whatever it plans to announce, as it says a trailer will be instantly sent out to Insomniac newsletter subscribers. However, some trailers can be pretty bad, so it might not feature gameplay at all. So what could the game be? Resistance 3 is due to show its face, with a billboard accidentally revealing it last year. A new Ratchet & Clank game, perhaps downloadable like Quest for Booty, wouldn't be surprising either. Insomniac calls the game "our upcoming PlayStation 3 project," which is language that indicates it's not a part of the deal the studio signed with EA Partners to develop a multiplatform game. I know I won't be able to get to sleep trying to figure out what it's going to be.